In 2018 has been produced sailboat Nautitech 46 Fly called COSMOS FLY. This yacht is based in harbor Preveza in region close to Ionian Sea in Greece. You can board up to 10 passengers on the sailboat COSMOS FLY. 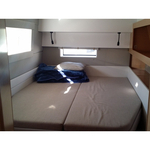 Configuration of berths is 10. 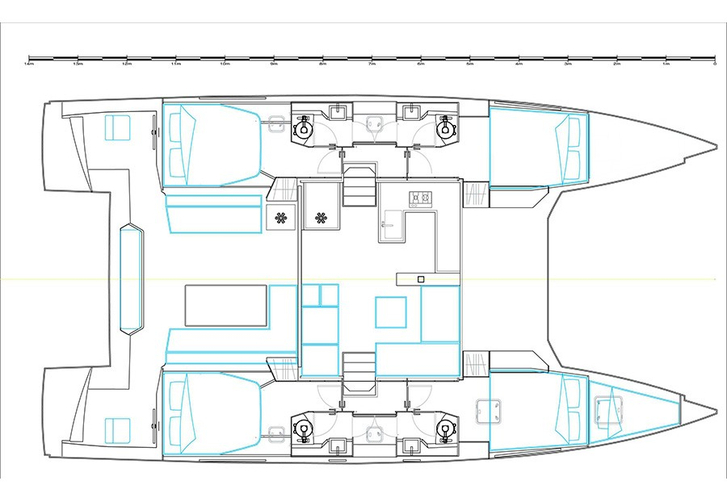 There are 4 bedrooms located below boat's deck. COSMOS FLY has 4 WC with showers. Analyze other yachts clicking here: Catamarans Ionian Sea. Diesel tank is 600.00 l l. big , water container has up to 600.00 l liters. In this sailing boat is installed engine 2 x volvo 40 hp. 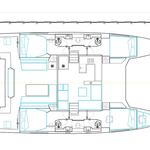 With 13.71 m of lenght and 7.54 meters of beam COSMOS FLY offers enough space for comfortable sailing. Nautitech 46 Fly COSMOS FLY is equipped with: Bimini top, Anchor electric windlass, Dinghy, Bed linen, Radio / cd player, Air conditioning, Heating, Autopilot, Gps, Gps plotter, Mainsail with lazy jack, generator, Solar panels. . Deposit is 4000.00 EUR. You can search more search results by going here: Catamarans Preveza.